Norwegian Cruise Line, which is headquartered in Miami, is one of the world’s largest cruise operators. Norwegian’s ships are instantly recognizable by the large, colorful murals painted on their bows. Norwegian offers an extensive line-up of cruises from Miami, with many ports of call throughout the Bahamas and the Caribbean, including stops at the cruise line’s own private island, Great Stirrup Cay. 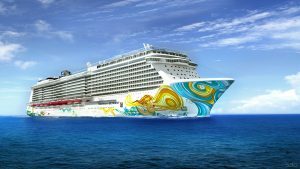 Norwegian Cruise Line ships sailing from Miami include Norwegian Escape, Norwegian Getaway, Norwegian Sky, Norwegian Star, Norwegian Bliss, Norwegian Jade, Norwegian Sun, and Norwegian Breakaway. One of Norwegian Cruise Line’s newest and biggest ships, the Escape provides passengers with tons of entertainment, activity, and dining options. The Norwegian Getaway is a big ship with lots of options for passengers, including 28 restaurants and multiple entertainment venues, plus ropes courses, a climbing wall, and a zip line. The Norwegian Sky sails a regular schedule of 3 & 4 night cruises to the Bahamas, plus 4 night cruise to Cuba. A free beverage package is included with all Norwegian Sky cruises. The Norwegian Star, which only spends part of the season in Miami, offers a variety of cruises including one-way Panama Canal crossings to Los Angeles, Caribbean cruises, and Transatlantic crossings. Norwegian Bliss launches in 2018 and offers cruisers a wealth of entertainment, dining, and accommodation options. The 2,402 passenger Norwegian Jade was refurbished in 2017, with new dining rooms and new furnishings. The Jade sails a variety of itineraries from Miami. The Norwegian Sun is an occasional visitor to Miami, offering a variety of cruise itineraries. The Norwegian Breakaway is a large, modern cruise ship with interesting features such as The Waterfront seaside promenade, a Thermal Spa Suite, and an activities deck that includes spectacular water slides and a challenging ropes course.